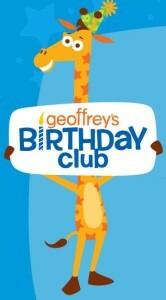 If you have a little one, be sure to sign them up for Geoffrey’s Birthday Club. As their birthday approaches, your child will receive a birthday card and gift from Geoffrey every year until he/she is 10. The gift is generally a coupon for $$ off a purchase, such as $2 off a $2 purchase. Keep in mind, the actual savings amount has changed over the years. Go into the store on, or near, your child’s birthday for some extra-special attention, including a birthday crown, Geoffrey balloon and a personalized announcement broadcast to the entire store! Register today to surprise your child with a birthday call from everyone’s favorite giraffe! Participation optional.